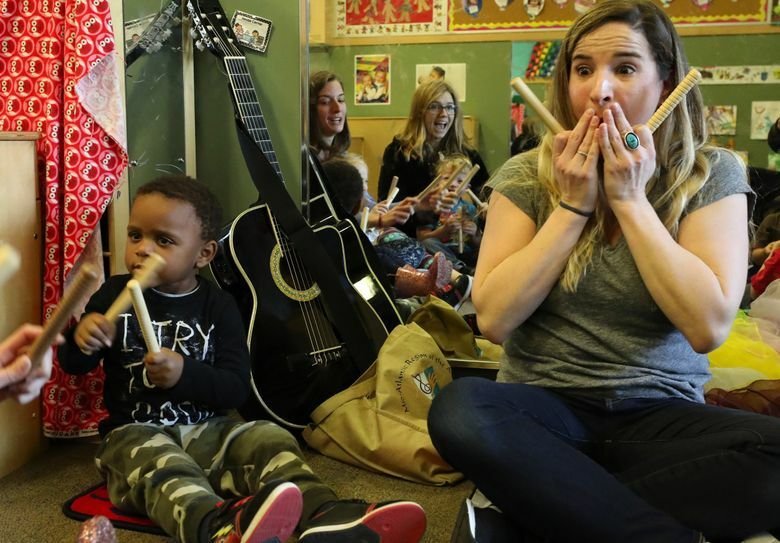 “For kids who have chaos and unpredictability in their lives, music has structure, music has predictability,” says Alyssa Monas, a music therapist at Childhaven, one of 12 nonprofits helped this holiday season by reader donations to The Seattle Times Fund For The Needy. Alyssa Monas sits before a half-dozen toddlers, clutching a steady old friend, the $150 acoustic guitar her mother bought for her on a cable shopping network ages ago. “Good morning, friends,” Monas says, her eyes wide with expression. “I’m going to sway my body,” she says, inviting them to join. Some bob their heads or lean side-to-side. A few have a case of the wiggles, and flail with their hands. “I see Ricky swaying,” Monas says. She points out when each child joins, and then begins to strum. Her voice fills the Seattle classroom. One boy erupts in emotion, throwing his hands into the air, rolling back on the floor and then twisting his blond curls through his fingers. Monas looks each child in the eye and sings their names in cadence of the song. At first glance, it’s easy to mistake this scene. It’s not music class or a choreographed performance. This 25-minute session is important therapy for the children at Childhaven, an organization that provides free early intervention, counseling and early learning services to families experiencing trauma or adverse effects from exposure to difficulties like abuse, neglect, addiction, homelessness or mental illness. Music — universal, structured and fun — can be the therapy that resonates with children struggling to connect. Childhaven often treats children who have developmental delays and whose families are sometimes experiencing a crisis. 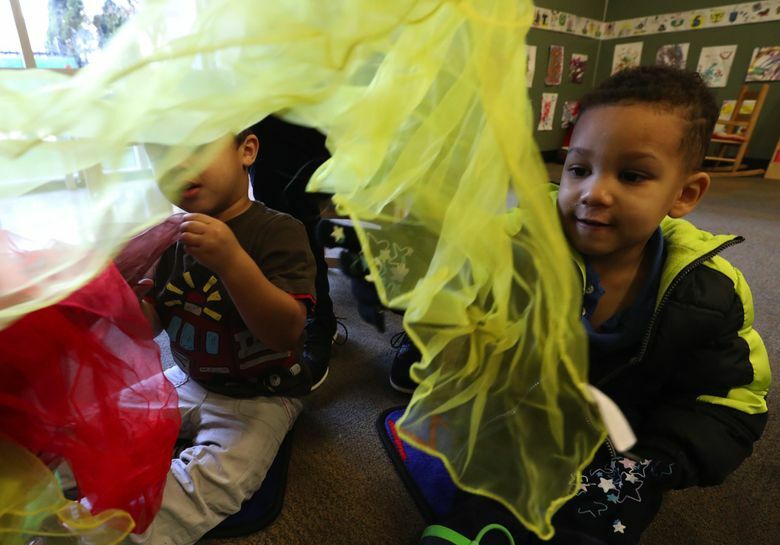 At its three King County locations, Childhaven serves about 300 children. $25: Puzzles and games for one classroom to help children reach developmental milestones. $50: Car seat to safely take a child to and from Childhaven each day. $100: Therapeutic session to provide a trauma-affected family with science-based mental health support. Childhaven is one of 12 charities helped by reader donations to The Seattle Times Fund For The Needy holiday campaign, which has raised more than $23 million in its four-decade history. For Childhaven, music therapy is a new offering that works in concert with a range of other programs the organization offers. Monas, a board-certified music therapist, started the grant-funded program last spring. It expands on Childhaven’s holistic treatment approach and provides another way for clinicians to connect with kids, meet them on their level and help them develop. Monas’ work is rooted in science and evidence from research. So much more is happening in her sessions than meets the casual eye. Take the ‘Hello’ song. Monas begins every session with it and always ends with her ‘Goodbye’ song. “Children respond to routine. They can feel safety in routine and structure,” said Barbara Else, research and policy adviser to the American Music Therapy Association. 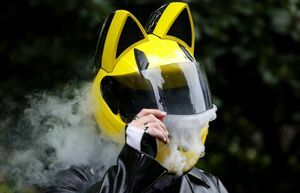 Before the song began, Monas greeted the group with bright, exaggerated facial expressions. 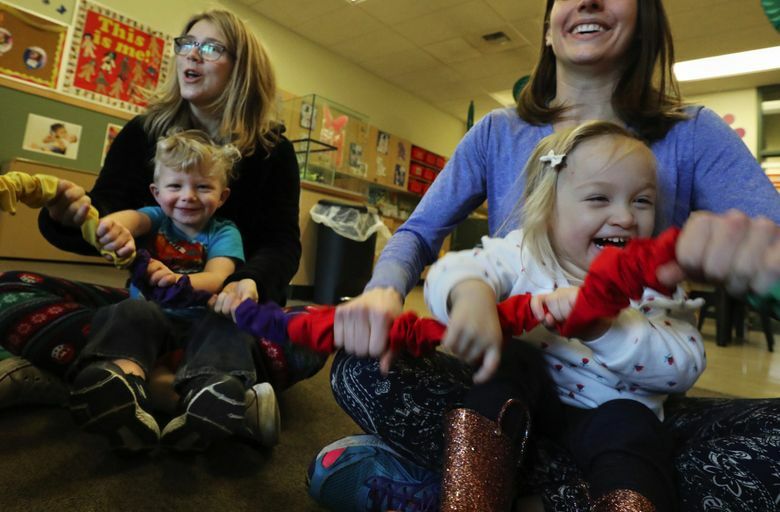 “We make big eyes and we speak exaggerated so they’re understanding what’s going on and paying attention to you,” said Petra Kern, a University of Louisville adjunct professor of music therapy. After the greeting, Monas asked the children to sway. As young parents know well, rocking side-to-side can soothe children. It stimulates body awareness, or proprioception, which can help kids feel connected and oriented, Else said. The swaying also encourages entrainment, synchronicity with others through rhythm, which can help the children connect within themselves and with others. 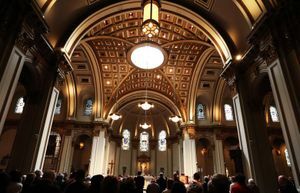 By calling out each child’s name during the ‘Hello’ song, Monas created a “loving environment where we can develop healthy praise and a secure relationship,” Kern said. Monas also taught kids how to greet and interact. “A little song like that, 3 to 5 minutes, teaches children what’s appropriate in society and from a cultural perspective,” Kern said. After the “Hello” song, the kids grooved out excess energy to “Baby Shark,” a crowd-pleasing earworm. Then, Monas led the kids in pretending to bundle up for cold weather, play in the snow, enjoy a mug of hot chocolate and bake cookies. They selected colorful, sheer scarves as pretend snowflakes, and then crumpled them up into play snowballs. Each activity was accompanied by Monas’ voice. “Play is the work of the child. That’s how they learn, through playing,” Kern said. During the session, Monas raised the group’s intensity using rhythm and tempo, and later calmed the beat. “We’re working on emotional and arousal regulation,” Monas explained before the session. When she passed out the colorful scarves one by one, Monas emphasized impulse control and waiting for peers. After, she demonstrated how to blow on the snowflake scarves, an exercise that shows kids how to control their breathing, which can help them relax. During the session, Monas pulled out kid-favorite “stretchy band,” a ring of elastic material that looks like a giant hair scrunchy. She uses the multicolor band in several ways: To have everyone grasp the band and feel part of the group, to teach colors and also to explain appropriate ways to express emotion. Sometimes, Monas will sing lyrics about being mad as kids yank and squeeze the elastic band. Throughout the recent session, Monas’ eyes flitted across the room. 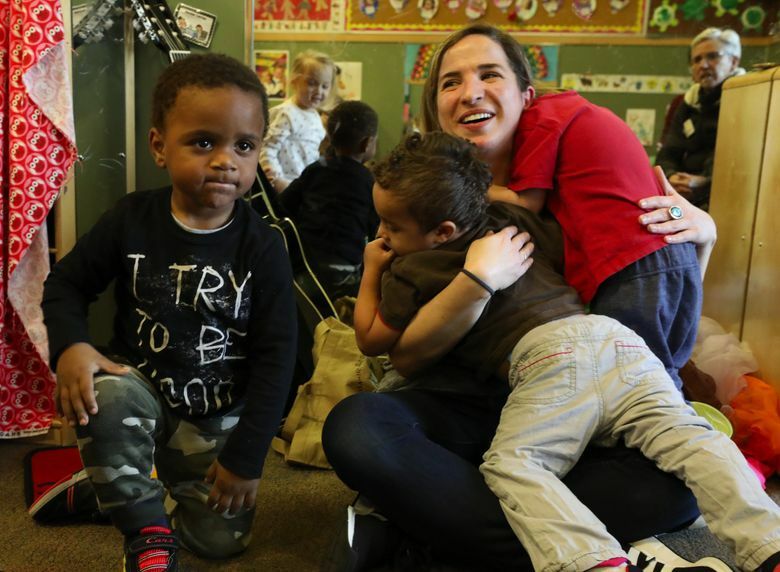 She was looking for moments to connect, but also probing for signs that children might be facing difficulty outside Childhaven’s classroom. “If that kiddo is going through challenges at home, that shows up in here,” Monas said. 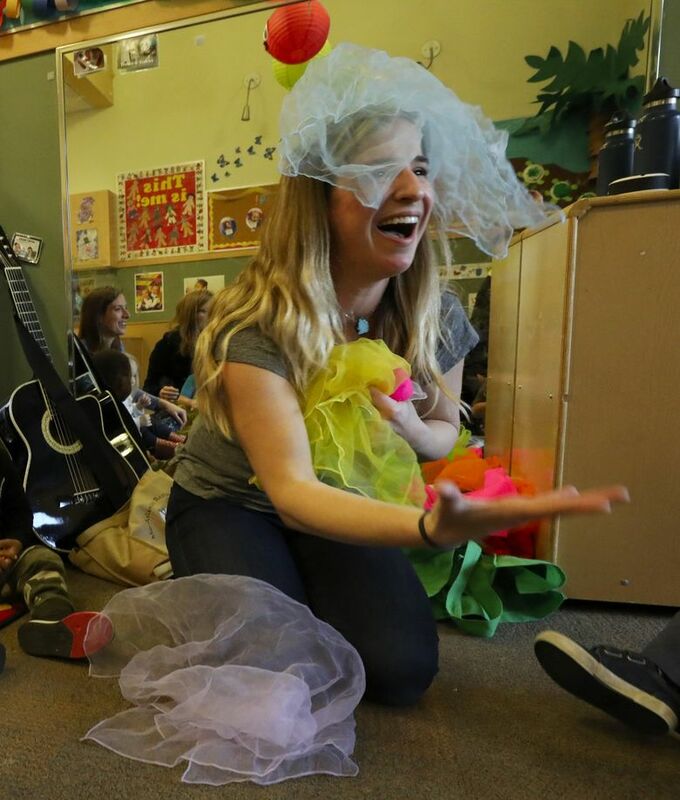 On the fly, she tailors each session’s music to the kids, reacting to blank stares or signs of overstimulation. “I’m trying to make sure every kid feels safe and comfortable,” she said. It seems to have worked. When the ‘goodbye’ song had been sung, two toddlers scrambled over to Monas and draped her in bear hugs. For kids struggling for developmental footing and dealing with trauma, music can be the tool that draws them out, helps them engage and spurs their advancement. At Childhaven, it’s one of many specialty care options that case managers rely on for kids. Often times, it takes a range of supportive programs to help families get on track. The therapeutic work that Childhaven does is not easy, Lanthier said. It can be expensive. But building up parents and giving kids access to the resources they need to thrive is well worth the investment. “There is nothing more expensive to our society than the effects of trauma that is untreated,” he said. Amy Cimprich came to Childhaven with her two boys when she was living in a Nickelsville tent encampment and struggling. Her son, Ian, who is on the autism spectrum, had been traumatized as a result of homelessness. He needed speech therapy. She was tired. Scrambling to find stable housing and keep her children nourished had taken a toll. Getting her sons to Childhaven each day provided a healthy routine for Cimprich’s family. Childhaven became her anchor and support system. When she needed diapers or rain coats, the organization always came through. Childhaven offered parent-child interaction therapy with Cimprich and Ian. A therapist, looking out on a playroom through one-way glass and talking to Cimprich through an audio earpiece, coached her on how to connect and play with Ian. “It helped me pull him out and get him to verbalize with me in ways I couldn’t do at home,” Cimprich said. Cimprich has a home now. Her children have graduated from Childhaven’s programs. “They’ve become very resilient little boys,” Cimprich said. Although her kids no longer take classes at Childhaven, Cimprich still visits, for parent-support meetings.